This is so true and accurate. Excellent article. Everyone should read this to understand city shelter struggles and the need to be responsible. We only feed Holistic food and treats with added supplements (i.e. probiotics) so our rescue dogs and cats get healthy and happy! Application: Please read and fill out our on-line application. Your application will inform us about yourself/family and the type of companion animal you would like to adopt. We will try to find the perfect match or help you in your search with our extensive network of other animal shelters and rescue organizations. Also view "Guardian Assistance" and "Other Shelters" listed in our Find a Pet page. Contact: A volunteer FFR Adoption Counselor will contact you within 72 hours if the dog or cat is available and a match. The counselor will coordinate a meet with your family and foster home at our weekend adoption showcases. Meet: You and your entire family/household (incl. 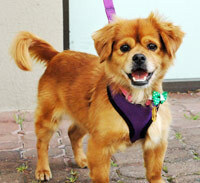 your current dog/dogs) meet the dog or cat at our adoption showcase and talk to the Adoption Counselor and foster home. Home Visit: If a match, the Adoption Counselor will set up a home visit. Home visit is for the animal's safety and respect for our foster home's emotional bond to their foster dog or cat. If you are renting your home, we will need "Written Landlord Approval" for the pet you wish to adopt prior to our home visit. If you own your home, provide name(s) on Deed (FFR may ask for proof of home ownership documentation (e.g. property tax bill in your name, deed showing title in your name, or mortgage statement in your name). Meet and complete Adoption Contract and pay adoption fee to bring your new furry kid home! Vet records will be sent to you. We will register the animal's FFR Home Again ID Chip for you. Life time registration included with current Home Again ID Chip. The dog or cat already suffered loss and abandonment prior to us rescuing them. Our foster homes train and care for the dog or cat like their own pets and love them. Please make sure you are truly ready and can make a life-long commitment to the dog or cat. Should the dog or cat not work out after you adopt, we will take them back for life or find them a new adoption home thru FFR. We will refund half of your adoption fee if returned within 2 weeks of adoption date. With each personal adoption from Furry Friends Rescue (FFR), you will receive a profile of your new furry friend from their foster home, training tips to help you and your new dog or cat get off to the right start to insure a forever home for life. The animals have been abandoned at least once already so you need to make the life-long committment to the dog/cat. However, should the animal not work out, we will take them back for life or help with new placement thru FFR. We will refund your adoption fee if under 30 days. We highly recommend you and your new dog attending Dog Training classes. There is mandatory training for puppy adoptions. See Behavior/training tips/classes. Mandatory Puppy Training Classes and socials are required for our Puppy Adoptions to ensure the puppy will get the right start and guidance! $100 Refundable Training Deposit. Must sign up for Puppy Training classes in 2 weeks of adoption and complete training classes. The critical period of socialization and training lasts for the pup's entire life. See our Behavior/Training page for list of trainers, puppy socials, classes and training tips. Please read The Critical Importance of Socializing Your Puppy (Article) and other requirements detail in our How to Adopt Puppy section. Every rescue dog, puppy, cat & kitten are seen by vet, vaccinated by vet, dewormed, ID Micro-chipped, FFR ID Tag (dogs only), get flea protection or grooming as needed, and Spayed/Neutered. Our dog & pups come with their collar, safety slip or harness and leash. Dogs/Pups vaccinations: DHPP, Bordetella, & Rabies (when 4 mos). Additional care as needed: Grooming, receive flea protection and any other necessary vet care, including special medical or emergency needs. We microchip every dog, puppy, kitten and cat that we adopt out. For more information on microchipping and it's benefits to you and your companion animal, see www.homeagain.com and www.24petwatch.com. Food: For optimal health, we feed and only recommend feeding a variety of high quality holistic and fresh foods & treats (made in the USA). Most of our dogs and cats have had a rough start in life. We want to make sure we place them in a committed and loving family FOR LIFE. So we go through a thorough adoption process to ensure the best match for both animals and a family. Thank you for your understanding! Adoption fee usually do not cover all our expenses (vet care, boarding, supplies, grooming, emergency/special medical needs) for every dog or cat. Indoor Family Member dog. Must sleep indoors in home (not garage). Fenced and contained yard so the dog has the freedom to go outside from the house to the yard for their potty business. Fence must be secure and TOO tall for the dog to jump over or escape. Must be walked daily or receive adequate exercise. Family must comply with all state, local laws and ordinance relating to keeping the dog including the leash laws. Every rescue dog is home fostered. Many were neglected, untrained and unhealthy when we rescue them in. Each are vet examined, vaccinated (DHPP, Bordatella, rabies), dewormed, ID chipped, groomed (if needed), receive flea protection (if needed), spayed or neutered and receive any necessary vet care. Some special medical needs and emergency care cost us about $1000 - $10,000 for their vet care. Each dog comes with their collar, FFR tag, slip collar and leash. Teen-Adult Dogs (8 months - 6 years old): $350 - $400 (Mix). $425 - $500 (Purebred), Chihuahua/mix & Pit/mix: $250 - As needed, add $50 refundable deposit for completion of Dog Training (refunded upon proof of completion). Family must provide the dog with annual vet exam and provide all necessary veterinary care as needed. Adoption from FFR is only consumate upon a home visit. Once we rescue a dog, we take him/her to our vet for exam, any necessary treatments needed, core vaccinations, deworm, ID Chip, bath/groom, boarding and provide them with all supplies (collars, leashes, toys, food, etc). Most of the time, the vet bill and supplies, always cost us much more than our adoption fee of $250. Please read more adoption criteria at Dogs section. Read the benefit of adopting a mature dog and How to Calculate Your Dog's Age. Small and toy breeds don't become "seniors" until around age 10. With healthy food and care, most are "middle age"! Why we don't adopt pups to families with young kids under 8 yrs old? Safety concerns with dogs and young kids? Someone must be home every 3-4 hours to care for and train the puppy. Fenced and secure yard so the pup has the freedom to go outside from the house to the yard for their potty business. Fence must be secure and too tall for the dog to jump over or escape from when they are full grown. Must provide pup with daily walks, exercise and social time. Family must comply with all state, local laws and ordinance relating to keeping the dog including leash laws. Every rescue puppy is home fostered. Each are vet examined, vaccinated (DHPP, Bordatella, rabies at 4-5 mos. 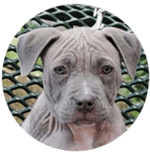 ), dewormed, ID chipped, groomed (as needed), receive flea protection (as needed), spayed or neutered (at appropriate age for their growth health) and any necessary vet care. Some special medical needs and emergency care cost us about $1000 - $10,000 for their vet care. Each puppy comes with their collar, FFR tag, slip collar and leash. Puppy (8 weeks - 7 months): $400 - $450 (Mix), $450 - $500 (Purebred/High Adoptable) , $300 (Chihuahua/mix & Pit/mix). Add to Adoption Fee: $150 refundable deposit for *spay/neuter ($50) and puppy training classes ($100). Sign up for Puppy Training classes in 2 weeks of adoption and complete training classes. Training and spay/neuter deposit will be refunded upon proof of completion. (Please also read our Puppy Adoption Requirements) If the puppy is already spayed/neutered, then the refundable puppy training deposit is $100. *$50 Refundable deposit for Spay & Neuter deposit. For the puppy's joint growth, immunity and behavior health as adults, we spay and neuter at 6 months or based on adult dog size. We want your puppy to grow up to be healthy adult dogs, live long lives and avoid suffering any possible early sp/n problems. We will schedule and authorize the appointment at one of our designated spay and neuter clinics. We cover the spay or neuter surgery cost only which is included in the adoption fee. Any additional needs (vaccinations, baby teeth extractions, dew claw removal) and cone will be the adopter's responsibility. We will refund the deposit after the puppy is spayed or neutered with spay/neuter certificate. Upon adoption, any additional needs, booster vaccinations, deworm, and rabies are the adopter's responsibility to cover and completed with their vet. Mandatory Puppy Socials and Training Classes are required for our Puppy Adoptions to ensure the puppy will get the right start and guidance! The critical period of socialization and training lasts for the dog's entire life. See our Behavior/Training page for list of trainers, puppy socials, classes and training tips. Suggested books: The Perfect Puppy : How to Raise a Well-Behaved Dog by Gwen Bailey and Before and After Getting Your Puppy by Ian Dunbar. We'd love it if you joined iGive.com and purchased these books through Barnes&Noble.com. If you start your shopping from our iGive.com link then part of your purchase will be donated to FFR. Adoption from FFR is only consummated upon a home visit and adoption contract. They cannot de-claw the cat. Family must comply with all state, local laws and ordinance relating to keeping the cat. Family must provide the cat with annual vet exam and provide all necessary veterinary care as needed. Adoption counselors must be able to meet with all family members who will be living with the cat. All our kittens and cats are home fostered by volunteers. Each get vet exams, vaccinated with FVRCP, deworm (strongid/drontal), spayed or neutered, ID chipped, receive flea protection as needed and FeLV tested (depending on age or based on current shelter protocols, FIV test is not accurate til after 6 mos. of age). Each cat cost us about $175 - $500+ for basic vet care needs and spay or neuter. Our fee does not include all their food and supplies we have to purchase. Some special medical needs and emergency care cost us about $1000 - $6000 for their vet care. Normal vet cost per cat would cost you about $300 - $800 plus and more for additional medical needs/tests. To help defray some of our vet bills on each kitten or cat, our adoption fee help cover their vet care. We appreciate donations to help match the cat's vet bills. Kittens (8 weeks to 7 mos): $160 - $175 each. Pair discount. Adoption from FFR is consummate only upon a home visit and adoption contract.